A $20 million new city council building is in the offering for Lower Hutt to give the city’s tired central business district a boost. Retailers, business leaders and the mayor agree the central city lacks a heart and there is tentative support for the Hutt City Council’s ideas. Along with the “multi-purpose civic building” proposed for High St near the Hutt River, councillors are also supporting a new bridge from State Highway 2 into the city, a riverside promenade and a green area around the NewDowse art gallery. The ideas, backed by a council committee last night, are part of longterm plans to revitalise the central city by 2030. A report prepared for the council says the central business district is unfriendly to pedestrians, full of big box developments and lacking in entertainment options. Lower Hutt Mayor David Ogden has called for help from a local retailing figure, in the manner of Newmarket Business Association’s Cameron Brewer, because of the big number of empty shops in the city. “I’ve been getting more and more frustrated that there doesn’t seem to be an effective way of addressing the lack of vitality and vibrancy here,” Mr Ogden said. The new council building was a good idea because the council’s existing premises would need $15 million to $20m of earthquake strengthening in 2018, he said. The proposed building roughly costed at $21.5m would include 6000 square metres of space for the council, as well as space for parking and shops. The council report suggests that moving into the struggling southern end of High St could spark development in the area, while a nearby public square would link the city and the Hutt River. But moving from the council’s present Laings Rd site would also mean finding a new owner, such as a hotel. Professionals Hutt City owner John Ross said the central business district “lacks soul” at present. It would be easy to find a developer who could take on the existing council buildings, he said. One retailer, Mandeep Pala, said there had been plenty of consultation about the proposals, though he was ambivalent about the council’s planned new home. 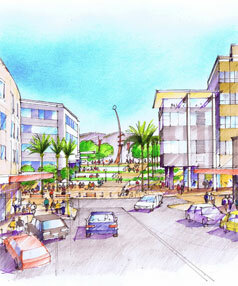 Artists impression of development in Laings Road Lower Hutt looking towards Hutt River. Mayor David Ogden told councillors at the recent meeting to make final decisions on the Community Plan that he is “very unhappy” with what’s happening in downtown Lower Hutt. There are too many empty shops (24 as at last month) and retailers who remain “could be better supported”. The $30,000 would “at least” pay for a part-time co-ordinator to try to get some action going. Cr David Bassett pointed out that Business Hutt Valley is proposing a special rate be levied on CBD businesses from 2010/11 to fund better promotion of High St, Queens Drive and the surrounding area. But Mr Ogden argued for “something to happen now”. He pointed to Newmarket, Auckland, as an example of a thriving retail destination where businesses pull together under a very energetic co-ordinator (Cameron Brewer). Councillors also added $20,000 p.a. to the budget to retain the retail co-ordinator for the Stokes Valley, Naenae and Taita shopping centres. A mix of carry-over funding and $100,000 of extra spending will be used to finish off the installation of paving, seating and trees throughout the rest of the Stokes Valley (Scott Court) shopping centre. There are also plans for interactive sculptures and the work will complement a proposed donation of an artwork by Guy Ngan. However, the work in Stokes Valley pushes out a proposed upgrade in Taita shopping centre by a year. Councillors agreed to this on the basis it made sense to finish off all the work in Stokes Valley instead of continuing to do it piecemeal, and because the proposed extension to Walter Nash stadium, incorporating the community hall, offers potential for a comprehensive look at what’s best for the Taita shops – including potentially re-orienting the opening facades of buildings. Completing a package of expenditure aimed at boosting economic prospects, the council agreed to lift its funding of Positively Wellington Tourism of $40,000 to $60,000. Mr Ogden said this recognises that PWT is making efforts to direct cruise ship passengers to TheNewDowse, Jackson St and Maori Treasures as well as ongoing work to attract long-haul airline services to Wellington airport. “I don’t think we can freeload off them,” the mayor said. Lower Hutt Riverbank Carpark Market does its success warrant a move? There is no denying the success of the Lower Hutt Riverbank Market on each Saturday (see photos on sidebar or here http://huttnz.vodspot.tv/). It is testament to the foresight of James Liu, the entrepreneur who launched the market five years ago, and built it to the success that it is, especially during the summer months with up to 100 stalls present. It is with this success in mind, the current problems with the CBD and traffic problems in Rutherford Street that the market causes that Sandra Greig Greater Wellington Regional councillor is suggesting that the market be moved to High Street to liven up the retail scene. She envisages closing High Street (from Waterloo Road to Laings Road) to through traffic. “Trucks selling produce could line one side of the street and on wet days they could use the shop verandas and turn the truck selling point inwards. Stalls selling food and beverages use caravans, garage sale folk can use trestle tables and canopies. It would turn the Hutt into a vibrant carnival city at least on Saturdays” (via Hutt News 21 April). David Kiddey, CEO of Business Hutt Valley is not in favour of closing off High Street to traffic ” for any reason at all” alternatives are suggested “With Dudley Street having fewer shops thats less difficult. Andrews Avenue is even better (for the market) because that can be closed off early without any real disruption. I think a better atmosphere could be created there” Some retailers get spin-off from marketstalls others see no benefit or regard them as unwanted competition. But Mr Kiddey believes a quality themed market for the Hutt CBD is “definitely worth debating” (via Hutt News 21 April). There is no denying that the current situation around the CBD is one that the council and councillors need to address quickly give the current economy and the draw of Queensgate. Recent consultative processes are addressing long term strategies for the CBD (https://huttnz.co.nz/2009/04/16/lower-hutt-vision-cbd-2030/) but High Street retailers and the general public are well aware of the downturn this area is experiencing. The council as leaders in this area need a call to action, by giving the right economic incentive in this area other entrepreneurs like Mr Liu or himself will quickly change the landscape. There is potential in creating a market, as the current Riverbank Market shows by its success, equally be aware such success did not occur overnight, the right environment occurred for it to suceed both from an economic and location point of view. The success of one does not automatically guarantee the success of the other if any of these factors are changed. Equally an investigation in how to tie the benefits of both to the CBD is well worth looking into, just make the process quick.